Tee shirts become costume accessories! 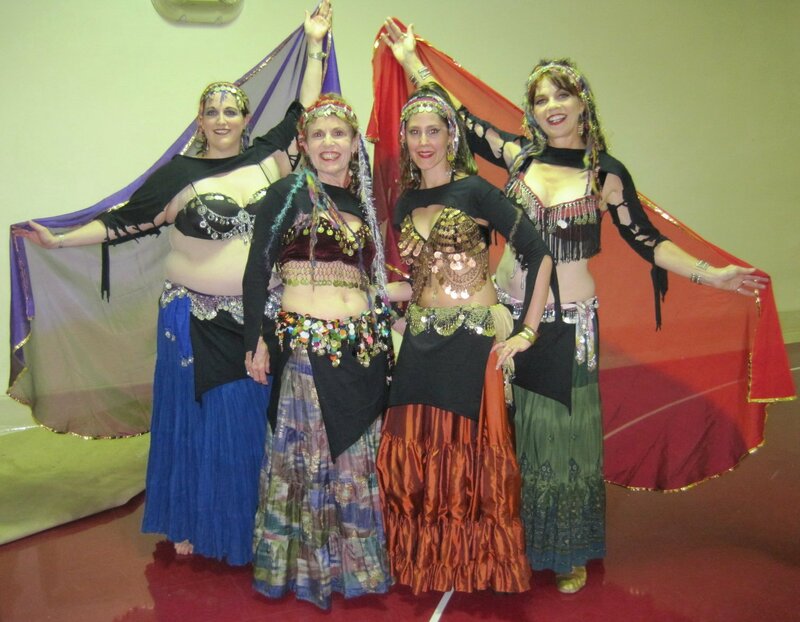 My performing group, PRISM, has always been as colorful as Birds of Paradise when it comes to our tribal costumes. I eschew wearing plain black onstage because it absorbs light and swallows the dancer. But, to look more in line with other tribal troupes, one of our dancers suggested designing black costume accessories to visually tie our motley crew together. Let’s face it, “black is where it’s at” for tribal dancers–at least as far as the bellydance world goes. And though I personally cringe at everyone wearing black, I do like how this unifies our disparate costuming. Materials: (for each dancer) one man’s long sleeve cotton T shirt in a size that will be roomy but not humongous for you. I wear size 14, so I bought a men’s size medium. In my performing group we have all sizes from petite to queen, and men’s small, medium, and large sizes worked fine for us. 1. Cut off the collar and the cuffs (you can wear the wristbands to wipe your face while you exercise). 2. Fold in half length-wise and lay flat on the floor (the shirt, that is!). 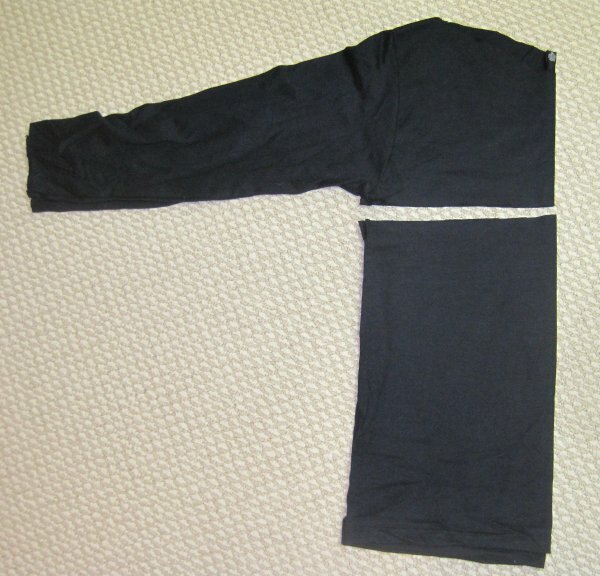 Cut off the body of the shirt right under the arms. This piece will be your accent skirt so save it. 3. Cut a scoop shape across the top of the shirt, to within a couple of inches of the shoulder seam, making a sort of “boat neck”. 4. Make several cuts about 3 – 4″ into the sleeve from the sleeve bottom (my sleeves had a seam here running the full sleeve length, so I cut off the seam after I made the vertical cuts). I made these sections about 3/4″ wide. These will be the ties on the sleeves. 5. I cut off every other section so the ties would be further apart; and then cut right across the body of the shirt, eliminating the armpit entirely. 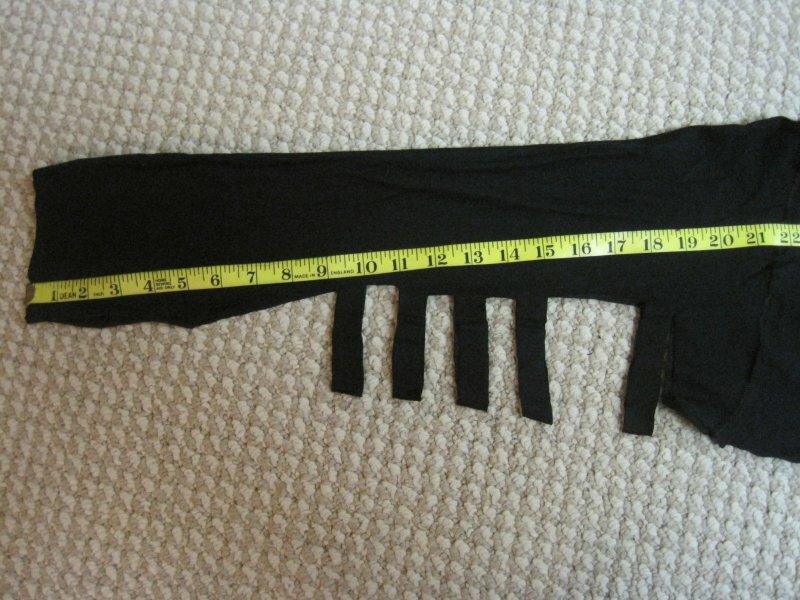 I also cut away the extra sleeve material below the slashes (from the elbow to the wrist), then cut the lower sleeve up the middle to where the elbow will be, so that two pieces will hang down at the elbow. 6. Tie the sleeve’s slashed ties together in square knots and try on your shrug. 7. 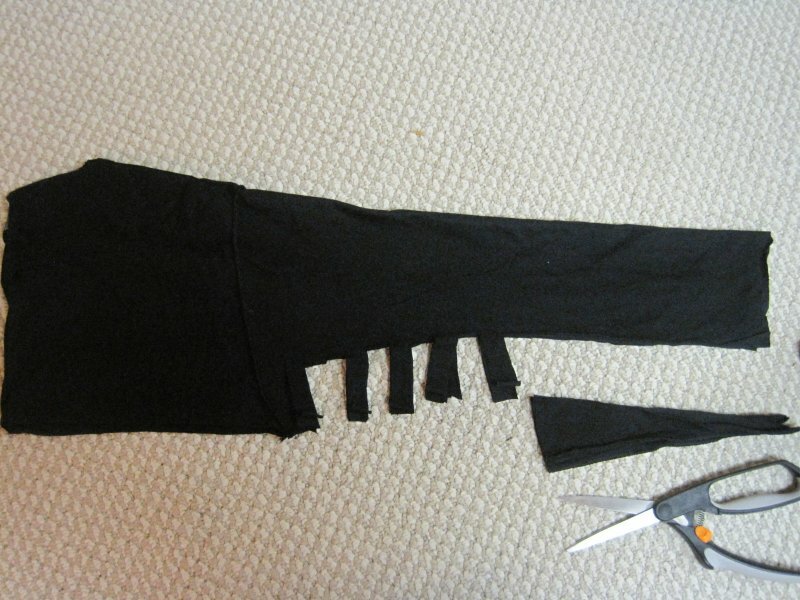 Turn the “skirt” upside down so the T shirt hem is now the hipband; cut up both sides of the skirt, leaving the hem intact. When you pull this on over your tribal skirt, you’ll have a front panel and a back panel. 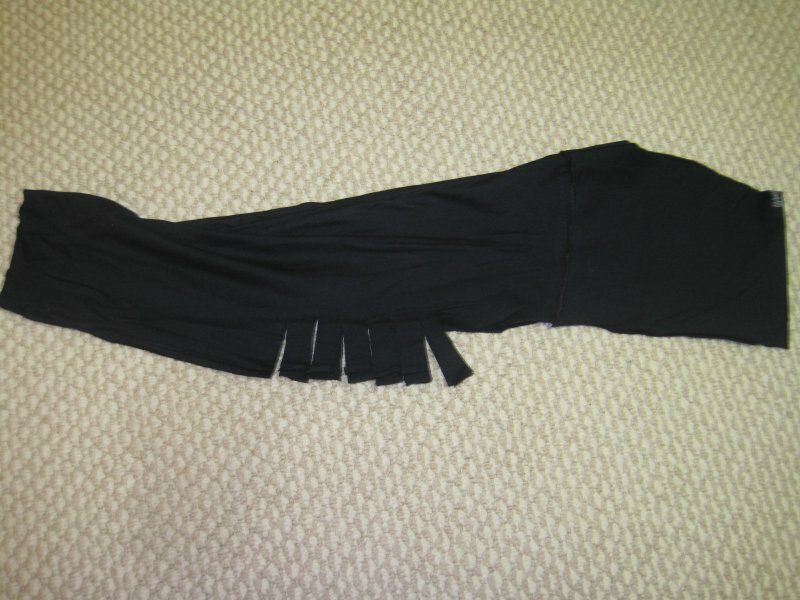 Pull and stretch the corners of the skirt and the hanging pieces of sleeve, it looks better that way. That’s it!